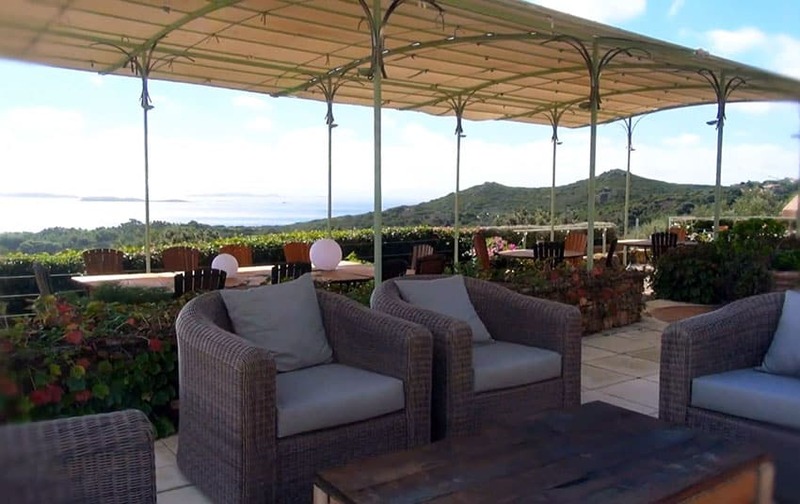 These pictures feature an ocean view French villa with rooftop terrace from the island of Corsica. The home offers multiple outdoor patio area from its three stories as well as a lounge deck with a view of the Mediterranean Sea. The home features a modern kitchen with colorful custom light fixture, a living room with an indoor rock wall and bedrooms with water views. Located in an island in the Mediterranean Sea southeast of the French mainland, Corsica is one of the 18 regions of France. 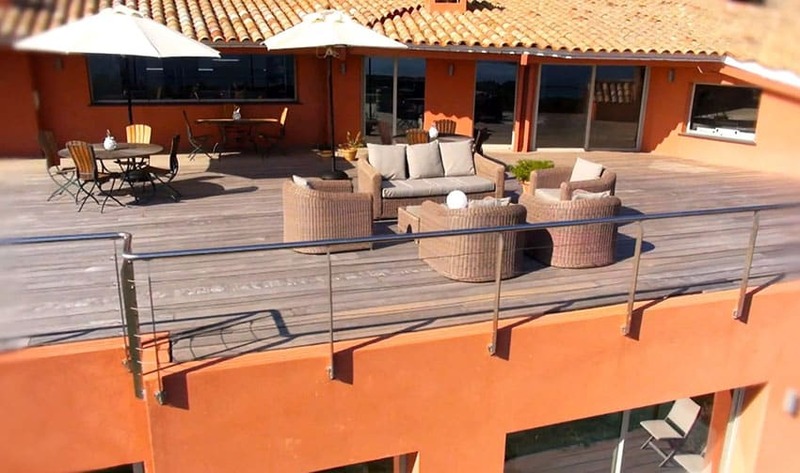 This ocean view French villa with rooftop terrace is both traditional and modern. Surrounded by the beautiful natural landscape, this villa uses space and quality materials – giving a feeling of tranquility while enjoying the countryside at its finest. This French villa rooftop terrace uses traditional roofing material adding texture and elegance to the property. Rounded terracotta tile roofing which is extremely durable and energy efficient, is perfect for that Mediterranean climate. Modern high quality composite decking made with a combination of wood and plastic with a wood-grain appearance has genuine beauty and low maintenance feature. 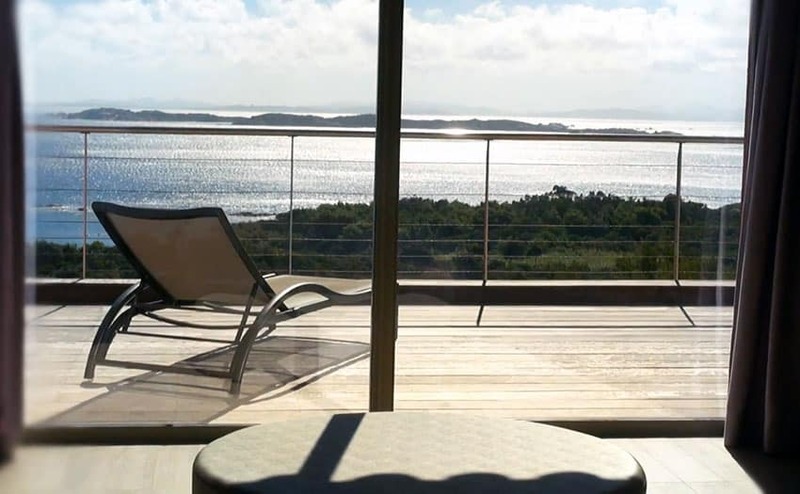 Stainless steel balustrade allows you to enjoy the view and still achieves a modern design scheme. 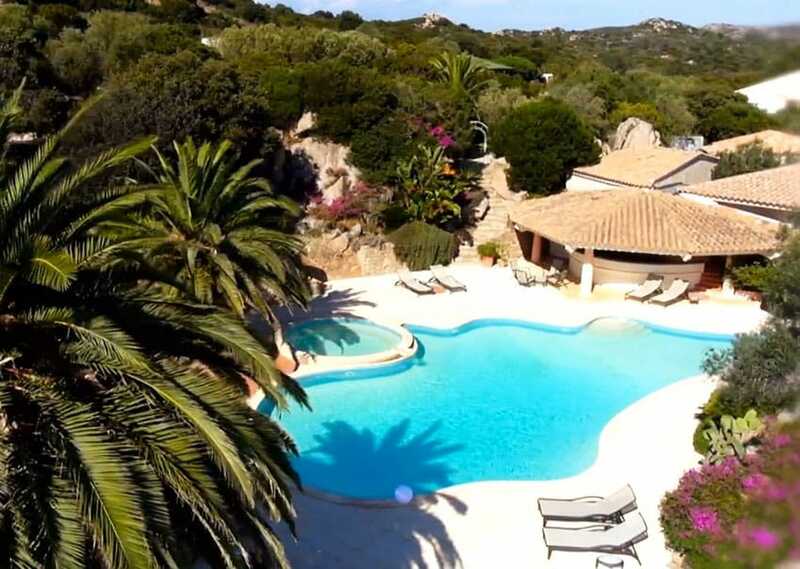 This French villa in Corsica, is ideally located in a secured private residential area by the hilltop overlooking a breathtaking landscape of glittering bay and dense forest – an island with an amazing topographical diversity and rich history altogether. A modern exterior features an arched pergola beams, lightweight resin wicker and wooden outdoor furniture, natural stone flooring gives this rooftop terrace a cozy and rustic look. This ocean view French villa creates a perfect setting to appreciate the landscape while enjoying a cup of coffee or any meal of the day. Bringing stone indoors from the cold can be a cozy idea. 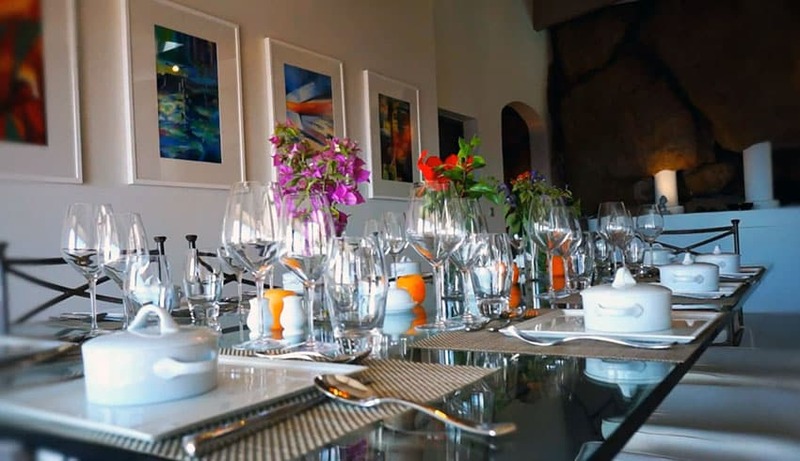 The beamed wood plank ceiling, contemporary furniture and lighting fixtures, stone boulders for the interior wall and other stone accessories creates a rustic feel yet at the same time signifies a modern eclectic design scheme. 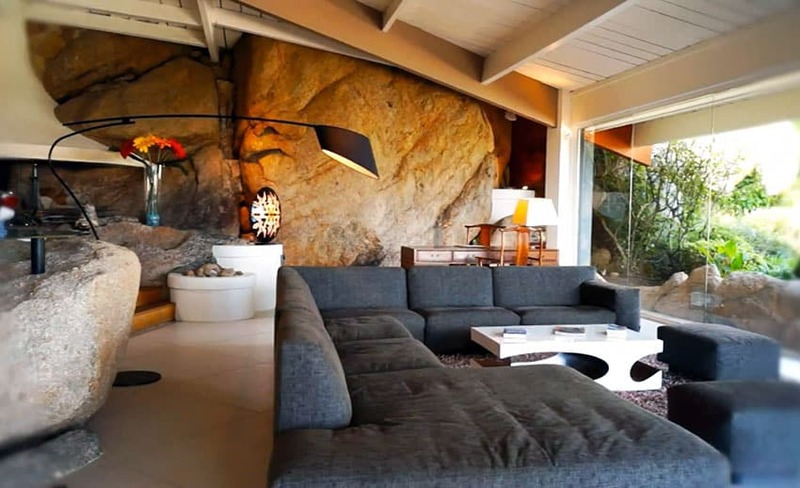 Inspired bu a natural design scheme, this living room features a soft and comfy sectional seating which compliments well with the hard and solid interior boulder wall. A fireplace, wooden floor and furniture adds warmth to the room. 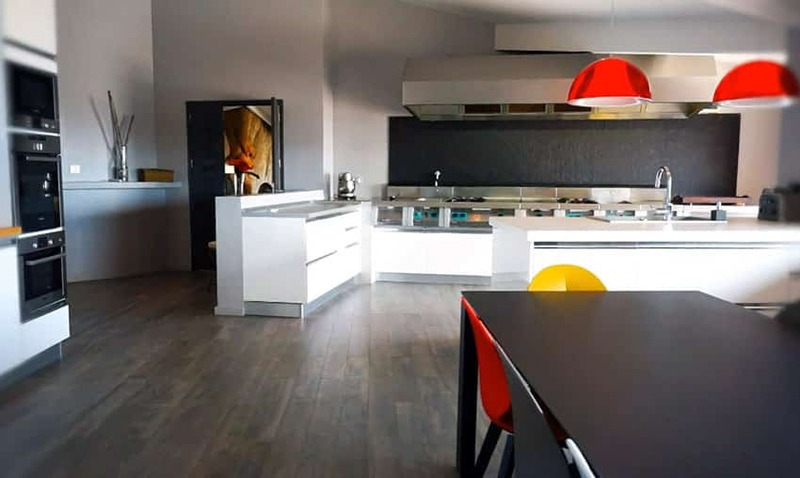 A modern open concept design scheme for this kitchen and dining area incorporates bright color accent pieces mixed with neutral dark finish for the floors, backsplash and dining table is balanced by the sleek straight lines and stainless steel countertop. The design gives a welcoming feel for a family gathering and entertaining guests. 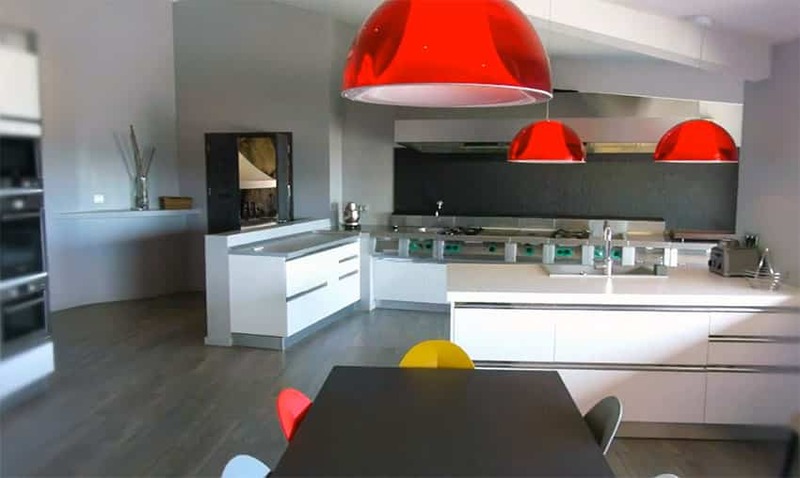 Classic white cabinetry in hi-gloss finish with modern hand-grab design, stainless steel appliances, bright red pendant lamps and mixed color dining chairs features a modern style kitchen and dining area. 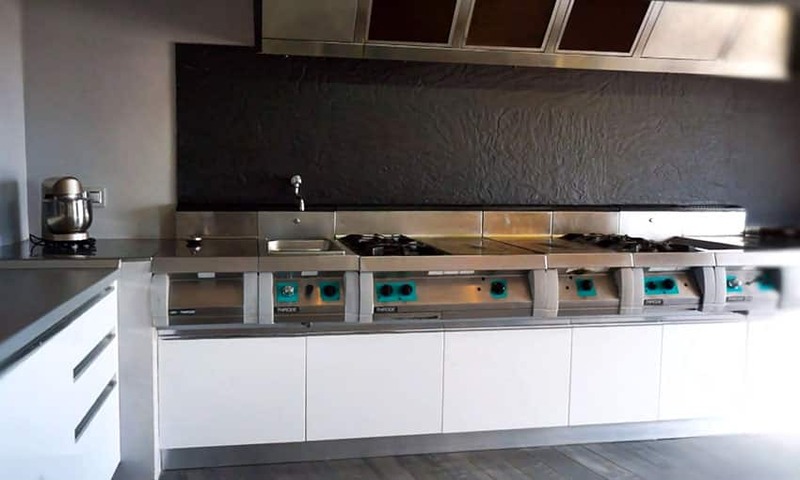 Cooking and food preparation have never been so enjoyable with the use of this stainless steel industrial gas burner stove and range hood. Stone finish in neutral color backsplash, stainless steel countertop and faux wood floors features a modern kitchen design concept. 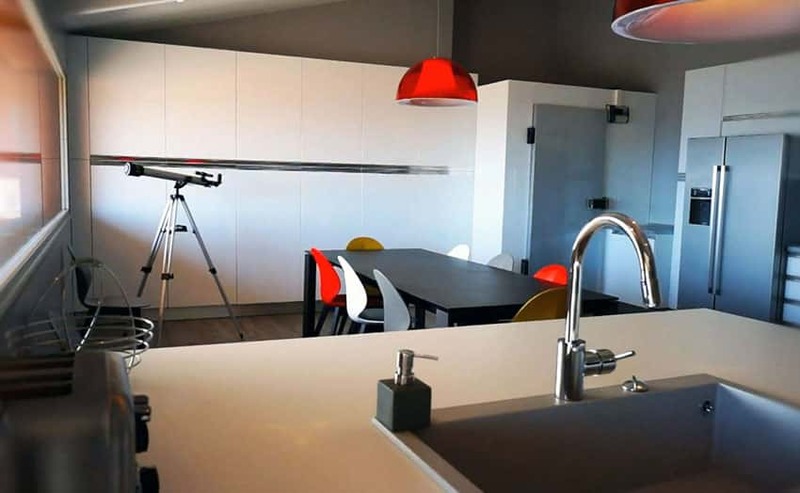 This modern design kitchen features flat panel hi-gloss white cabinetry, black paint finish dining table, dark tone finish flooring and stainless steel appliances. Bright red colored pendant lights and mixed color dining chairs adds accent to the neutral color scheme. 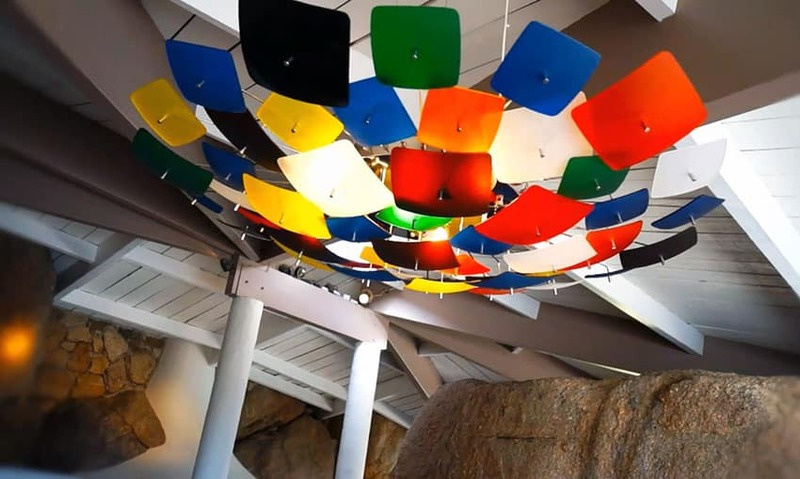 This square panel colorful modern light fixture suggests a wide variety of color scheme to choose from and adds warmth and life to the stone wall and wooden ceiling. This French villa features a long glass dining table and wrought iron dining chairs perfect for those intimate formal dinner with family and friends. Colorful artworks adorn the otherwise plain cement white wall. 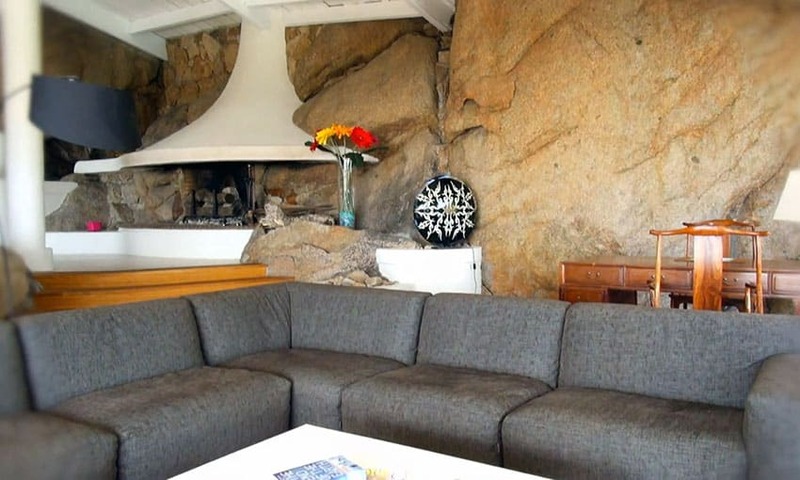 The large rock boulder wall provides a natural focal point for this dining area. 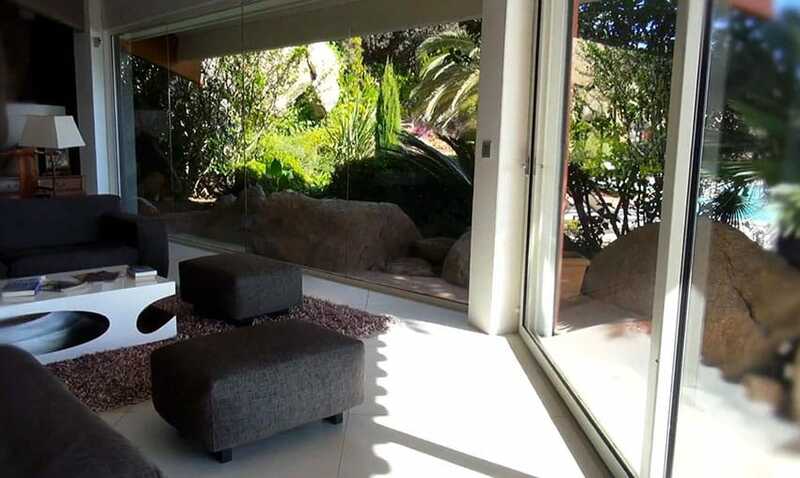 Large picture window and glass sliding door allows the beauty of the garden outside to be viewed and enjoyed indoor while relaxing in the living room. white ceramic tile flooring and neutral color upholstery let the colors of nature outside stand out throughout the living area. 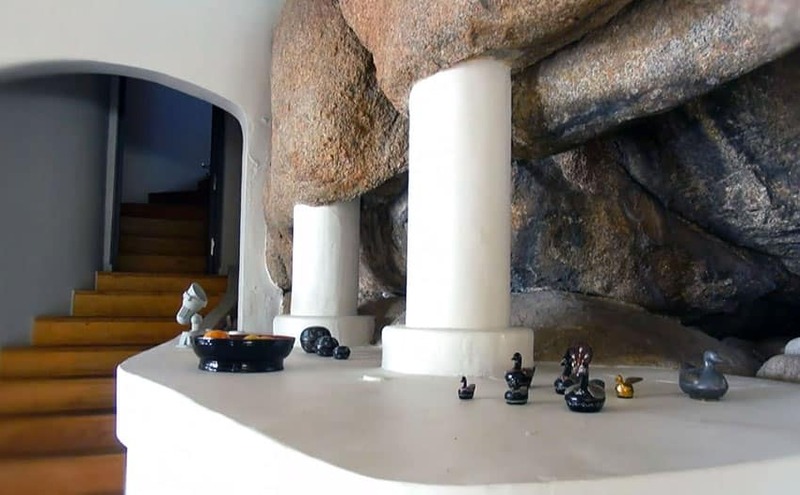 Man-made concrete cement supports this natural rock indoor feature. The light tone finish wooden stairs leads to the second floor of this French villa. 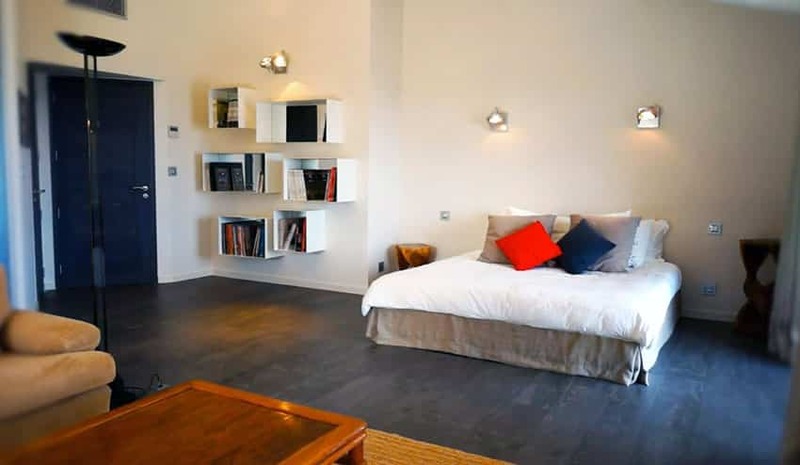 This French villa guest room feature a neutral color scheme inspired from the artwork on the wall – light beige for the walls, white headboard and white beddings and medium tone finish for the floors. Modern wall lamps and night light fixture are designed to create an ambient and task lighting accent. Blue accent color completes this Mediterranean beach color scheme. This French villa master suite features modern book shelves and lighting fixtures mixed with contemporary furniture. 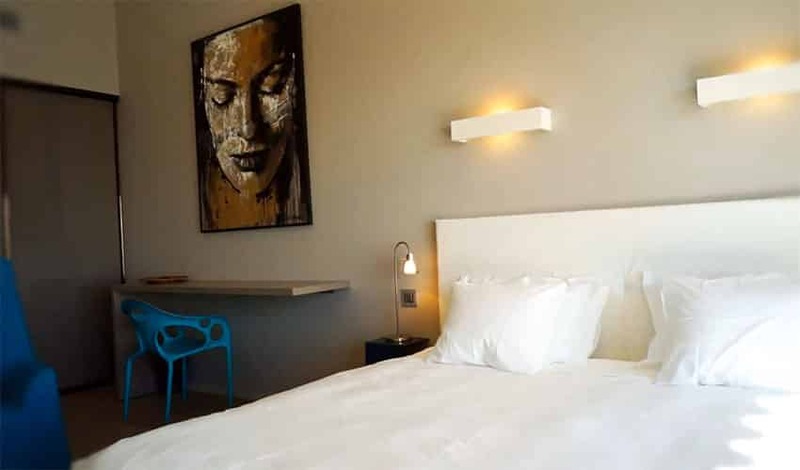 Cozy modern king size bed accented with colorful red and blue throw pillows is the focal point of the room. Light cream wall blends well with the dark tone finish tile flooring. This cozy bedroom features a purple accent wall which blends well with the cream paint finish of the headboard, wall lighting wood work and white beddings – perfect for that much needed goodnight sleep. Relax and enjoy the astonishing sight of the Mediterranean sea amidst the dense forest view on the second story bedroom deck of this French villa. Made of the most dense and durable hardwood, this outdoor deck is designed with a stainless steel cable balustrade which allows a full view of the landscape. 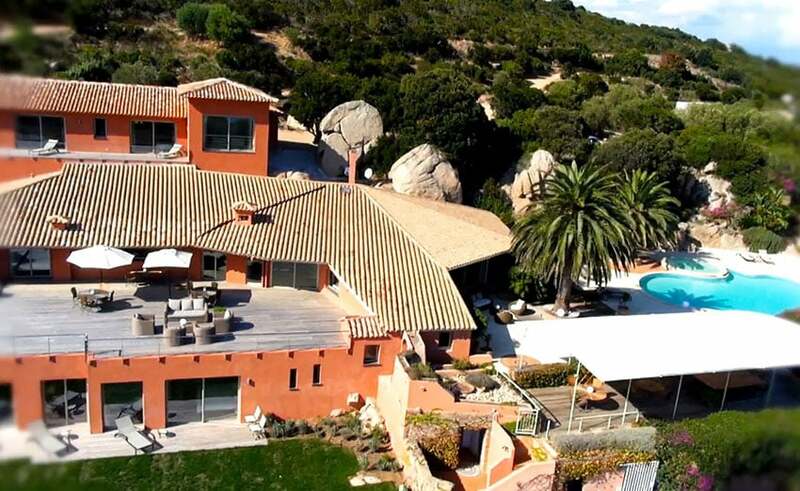 This French villa in Corsica is located in the proximity of high mountains, large stone boulders and dense forest provides a unique character to the property. This vast plot of land is designed with a beautiful landscape garden, swimming pool and rooftop terraces. The building materials are typical of the Mediterranean architectural design such as travertine for deck tiles and planks, clay and concrete tiles. 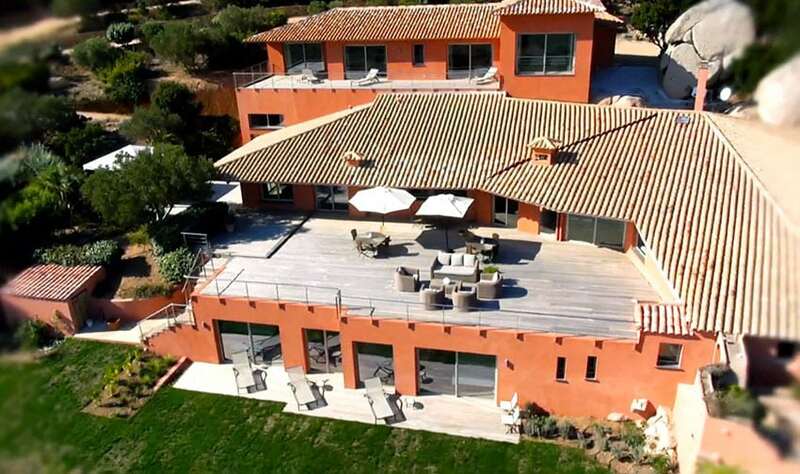 Making this French villa more elegant is the use of scalloped clay tiles which are versatile, long-lasting and energy efficient roofing material. Paving cuts of travertine stone is used for the patio and pathway leading to the main entrance, luscious trees, shrubs and boulders surrounds the villa creating a natural backdrop and landscape. 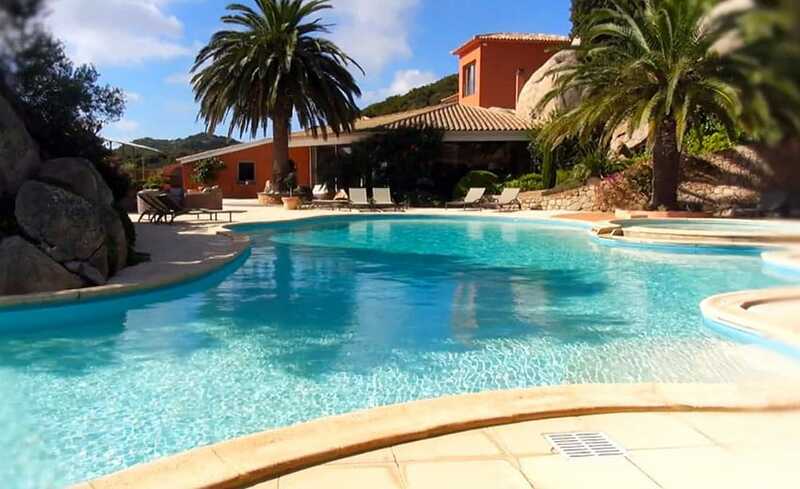 Experience Corsica’s natural beauty in this magnificent French villa in southern Corsica. 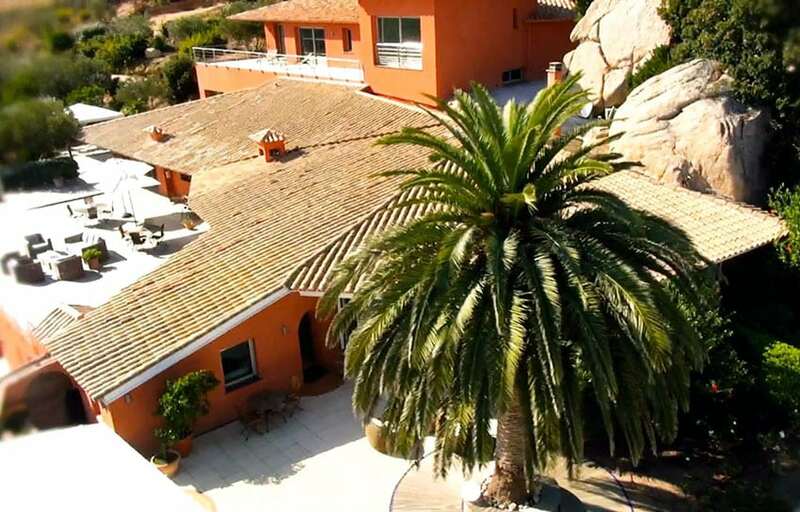 Located on a hillside, this secluded private property surrounded by trees and beautiful landscape, has two swimming pools, natural stone floors and an amazing 180-degree panoramic sea view. A view from the ocean view French villa with rooftop terrace. 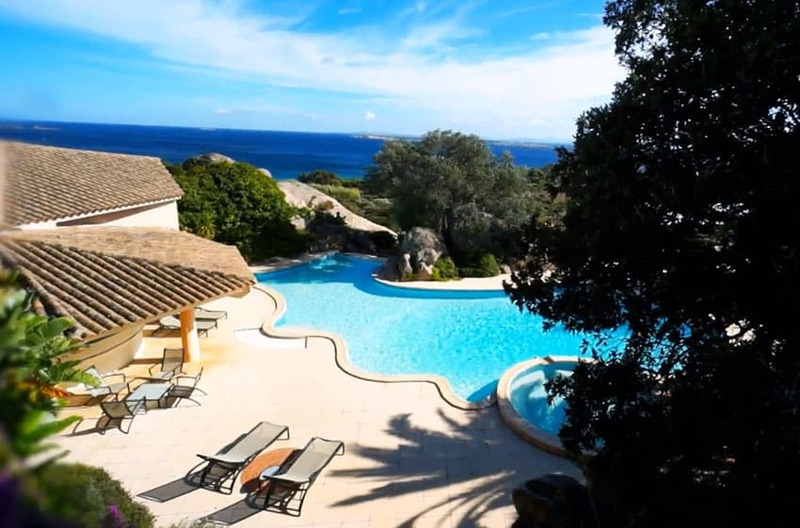 This French villa in Corsica offers a gorgeous view of the two swimming pools, outdoor lounge area, a bar and dining area plus a panoramic view of the sea and landscaped garden with tropical trees. French villa with heated swimming pools are a popular outdoor space attraction and provides glamour and style to this alfresco design. Surrounded by a beautiful garden, dotted with palm trees, stone-built retaining wall, an extensive lounge area and an astounding view of the rolling hills and the sea – this is indeed a perfect private hilltop retreat. 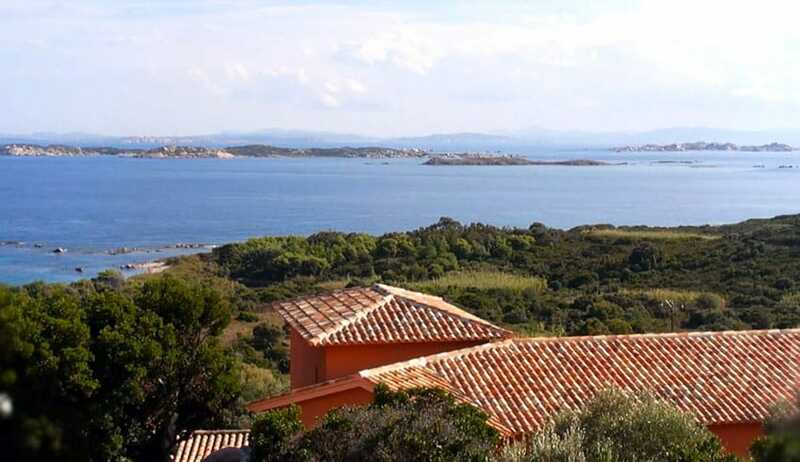 Escape to your own private French villa featuring a breathtaking view of the Mediterranean Sea. Relax and enjoy the heated swimming pool with a Jacuzzi. An extensive pool deck which extends out over the rolling hillside is designed with natural cut stones and mosaic tile flooring. 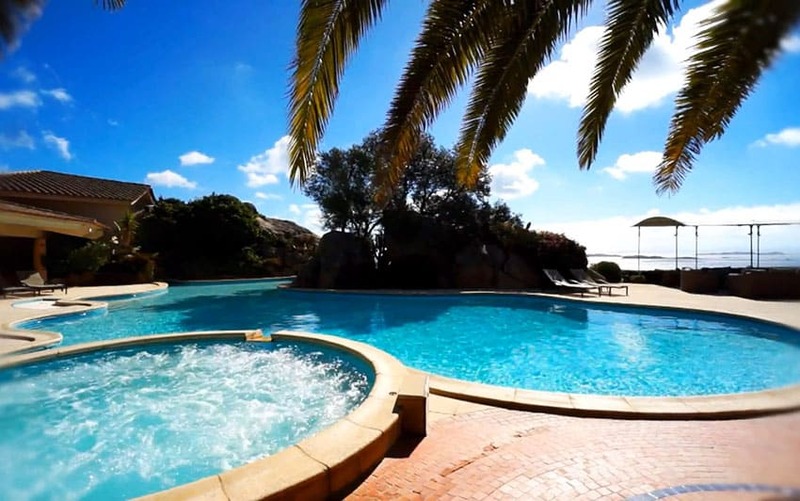 This video features “VILLA CORSE” (https://vimeo.com/84443916) by VIDEOPENPROD which is licensed under CC by: http://creativecommons.org/licenses/by/3.0/ – Changes made include editing screenshots.